Hør historierne den 11. september 2001 - af dem der var der - på 9/11 Tribute Museum i New York City. 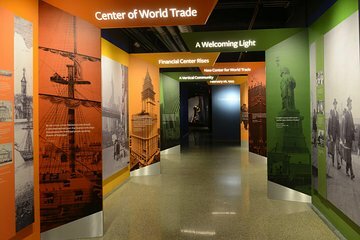 Beliggende i World Trade Center-delen af ​​Manhattan samler centret dem, der ønsker at lære om 9/11 med dem, der oplevede det - overlevende, første respondenter og redningsarbejdere, civile frivillige og beboere i samfundet. Udforsk udstillinger og gallerier og tag en unik vandretur på 9/11 Memorial, ledet af en 9/11 Tribute Center guide. This was a little confusing. I was under the impression that I was purchasing tickets to the 9/11 Museum by the Memorial. We didn't realize it was a different place until the lady at the ticket line told us it was the wrong museum. Titles/descriptions should be more clear. This is not the national 9/11 museum. We needed to buy additional admission tickets for the correct museum that we wanted. The families still did a nice job of putting the tribute museum together. I would give the museum itself 3 stars, but the actual Viator booking 2 stars, due to misinformation. This was the best part if our New York trip. Well done and very emotional. Good to get the experience from the family's side of things, it is the most accurate, non-biased recollection of the events of 9/11. Good when partnered up with the museum to get the complete experience.